His Grace Sumithra Krishna das is the President of the ISKCON Chennai Sri Sri Radha Krishna Temple. 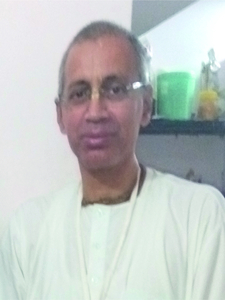 A student of mathematics, he joined ISKCON at the age of 21 in 1985. He had no prior information about ISKCON. A strong desire to dedicate his life to spirituality made him leave home and family in Bangalore. Hearing from someone that ISKCON takes young boys, he came to Chennai and searched for the ISKCON Chennai branch. When he finally found the small temple in Kilapuk Garden Road after searching for over two hours, evening arati was going on. As he was an expert player of Tabala, he joined in the kirtana by playing the mrdanga. The same evening he joined and shaved up the very next day. He got initiated after six months by His Holiness Jayapataka Swami guru maharaj. Sumithra Krishna spent the first seven years of his life in ISKCON as a brahmachari travelling all over South India spreading the teachings of the Bhagavad-gita and hari-nama-sankirtana as a member of the Traveling Sankirtana Party. His service initially was to translate the lectures of His Holiness Lokanath Swami and His Holiness Sridhar Swami who were in the traveling party. In 1992, Sumithra was given administrative services. He got married to Tarini Radha devi dasi in 1994 and they have four children. He was appointed as the ISKCON Chennai President in 2004 by His Holiness Bhanu Swami, the Zonal Secretary. Under his active leadership the gorgeous Sri Sri Radha Krishna temple was built and opened on April 26, 2012. Besides administrative services, Sumithra Krishna prabhu continues to enjoy performing Hare Krishna kirtana with the mrdanga. His Bhagavad-gita and Bhagavatham discourses are appreciated for their simplicity and good humour. He keeps up to date with the latest technology and uses them expertly for disseminating bhakti.